The 15 x 8 Lifetime Garden Shed wins our 2nd place pick for top sheds based on versatility, durability, storage space and value. Like our #1 pick this model is also a member of the Lifetime shed family and is extremely popular among shed owners for a number of reasons. Amazon users gave the Lifetime 6446 Garden Shed 5 out of 5 stars. Lifetime has a strong history in building quality sheds that last. This model is a perfect example of this company's focus on creating structures that are appealing to the majority of homeowners and could be used for anything from pool house to gardening shed or storage shed. 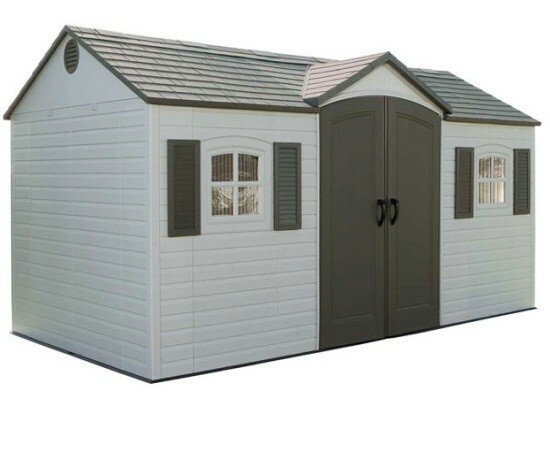 The Lifetime 6446 Garden Shed has all of the same great quality, construction and accessories of the Lifetime Storage Shed but offers even more cubic feet of space (750 compared to 620) for not that much more money and has a unique configuration. The central door layout, windows and skylights present a great option for adding staging tables and using the space as a potting or tool shed. Essentially, this slightly different configuration offers the possibility of the shed as an efficient work space or a storage space. As a bonus a few of the sites we researched were also offering a free solar light and padlock with the purchase of the shed. Lifetime's twin wall polycarbonate panels are superior in strength and sturdiness to the other models we reviewed and the built in storage system is simple, strong and very functional. If more shelving or accessories are needed, they come at a pretty good price although it would be great if Lifetime had some freestanding shelving units that locked into the walls available. Each of Lifetime's shed packages are competitive in pricing with the comparable models in other brands like Keter or Suncast but shelving and accessories are included in the price which when measureing apples to apples gives Lifetime the price point advantage. One thing we found about Lifetime Sheds is that their online manuals are a bit large and can be frustrating to download. We also read some reviews that said the instructions were just a little unclear in some areas and could use a blowup illustration of some of the critical fittings. Although the majority of people we talked to and the reviews we read, said that the shed was easily constructed by 2 people in an average of 8 hours. We had a 4 person crew and it took us about 5 hours including doing the inventory of parts. *Not including building the foundation. All in all we feel the Lifetime 6446- 15x8ft Garden Shed deserves the #2 spot on our list because of the superior quality, organizational features, sensible price and unique configuration.